The Weeks Family! Corinne, Justin, and Kamden! 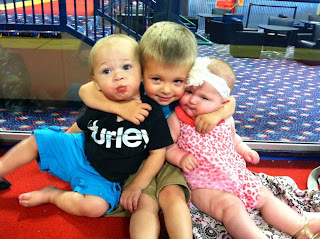 This is at Jumpstreet on Prestons Birthday, It was the best one we could get of all three of them. I love how Prestons squeezing them all tight! He loves these babies! Then my sister got this awesome picture! All smiling! I love these three babies, they are the cutest! 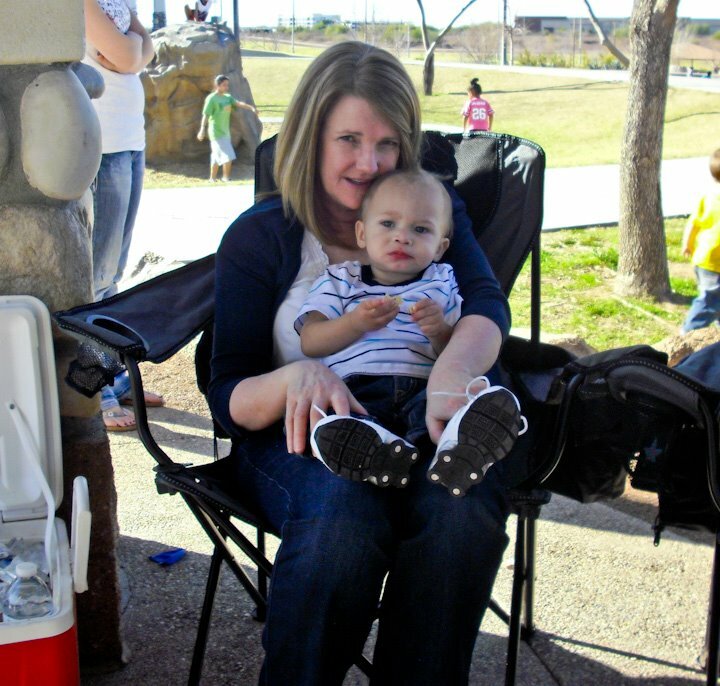 Kamden and I at the splash pad! 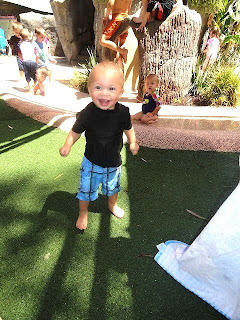 We went to the zoo the a few weeks ago and they have a splash pad area and Kamden loved it! I had to post this picture because he just looks so cute! I love this picture because you can see all his teeth! He now has 10!! So can I tell tell you how much I LOVE my iphone?? It feels like I never have cool phones, Justin is the one who always had them until now! 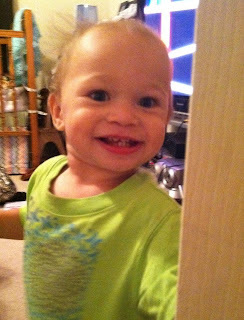 I just love that I can take a picture of Kamden on my phone and it actually turns out, my last phone they always looked like crap. I feel like I take more pictures of him now because I always have my phone with me, unlike my camera. 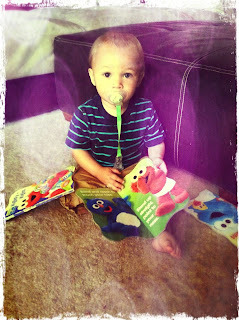 Well My sis-in-law told me about this new app called pixlr-o-matic and it is seriously my favorite! I think I might be obsessed! There are so many different things you can do with your pictures and they turn out so cool! So if any of you have a smart phone, get this app! You will love it! 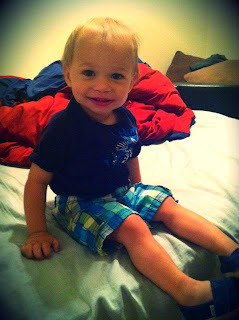 A little update of Mr. Kamden. He is getting so big and is into everything! He likes to take out all of our food out of the cabinents. Little mess, but we love him to death! His new word is "Hi" and its so cute when he says it. 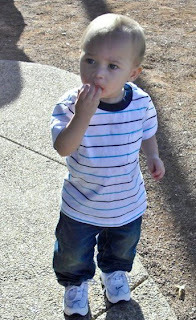 His new favorite fruit is grapes, he would seriously eat them all day! We just love his boy, he keeps us busy and makes life so much fun! He couldnt get any cuter! He also loves his cousin Preston! I love how happy he is in this picture! 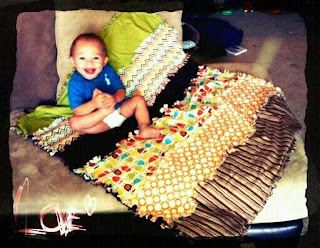 He loves his new blanket I made him! Man I love those blue eyes of his! I know Im a month late.. I know it was a whole month ago, but I am going to blog about Kamdens first brithday! 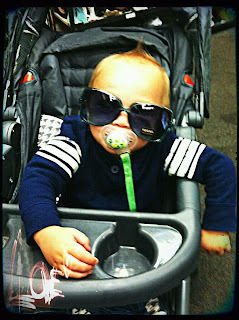 Yay, I cant believe my little baby is now one.. How does this happen!! Well we had a wonderful party to celebrate his party with our family and frirends! It was a lot of fun! I was so afraid Kamden wasnt going to eat his cake because he was getting a little grouchy.. It was nap time.. but boy did he go out it. He LOVED his cake. He had his own little "smash" cake and he ate the whole thing! This little man can eat. I swear he eats more than me and he is still just a skinny little guy! At 12 months he was 19 pounds and 30 1/2 inches tall! Hes still just tall and skinny!! This boy is probably the sweetest cuddley boy you will ever meet. He will always giving higs and kisses and I just love that! He is also a very strong little guy, he will fall down and just get up and keep running! We love this little boy so much and cant believe its been over a year since I had him! He LOVES to dance, and has some pretty good moves! ha He is so active, always running around doing something! He is always making me laugh, I swear this kid makes me smile like every 5 minutes. He is always doing something cute! We love you Kamden boy!!! Cousin Preston loved Kams "BIG" truck! He loves his aunt Chelsea! Kamden had such a wonderful birthday! Thank you all who came and celebrated it with him! Wow, it has been forever since I blogged! Our lives are crazy! Well went up to Utah for Christmas this year and it was one of my favorite Christmas's! I got to celebrate my birthday with my whole family and It was just so much fun having Kamden with us on Christmas, it made it so much more fun! I loved it! While we were there we got family pictures done! They turned out great, I am so happy with them and so excited to hang them on my wall! Kamden was such a smiley happy kid while taking pictures we got some really good ones of him! After a week and a half of us being there Justin had to go home to work and my parents went on a cruise so Chelsea and I stayed an extra nine days and stayed with Tanner and Court. I had so much fun hanging out with them, I sure do miss those two! We went to a dinosaur museum with the kiddos while we were there and we had a great time, it was a really fun place! And we also got to go to some of my little sisters basketball games, I love watching her play! 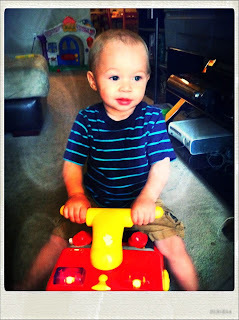 Now I will update you on what our Kamden boy has been up to! The kid is FAST! He is trying to run now and hes getting pretty good at it! He wil be one in 2 1/2 weeks and I just dont know how that it possible! This year has been the best, I really couldnt ask for a better baby! He is such a sweet, loving, happy little guy and he is very much loved! He is always giving kisses and loves and its so cute! We are so blessed to have him in our lives, he has made out lives so much more meaningful! This was on my birthday! Grammy reading the boys a Christmas book! A picture of the whole family on Christmas day after church! 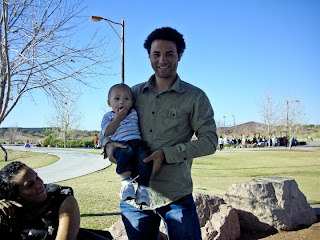 He loved watching Courts games! Kamden LOVES cousin Preston! He had so much fun playing in the bath with him! These next pictures are the family pictures that we took. Here are my favorites!! My Sweet Parents! I love them so much! Me and my cute hubby! We LOVE the beach! but who doesnt right? We are at clear water beach in florida on our honeymoon and it was probably the best beach I have ever been to! white sand, warm water, not too crowded.. it was perfect! Hello everyone! We got married July 10th 2009 and we are loving it! Justin is a wonderful husband and also my best friend! We have so much fun together, I couldnt ask for anything more! I love him to death! This is our baby Kamden Scott Weeks! He was born on Feb. 11 2011. 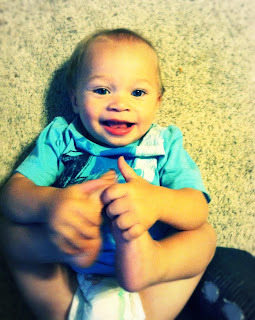 Kamden brings so much joy to our lives! We love him with all of our hearts!
. R Y L I E . S A N D O R F .
When life gives you ice, make some hot chocolate. And a fort. This was the best day of my life! We got married in the Snow Flake temple July 10 2009 for time and eternity and it was very wonderful, just like I always pictured it would be. We had alot of family and friends there! We will never forget this day! I love my life! we are so happy! Im excited for the rest of our life together! This is at Sea World as you can tell. Ha this is also on our honeymoon. Im obsessed with dolphins so it was alot of fun! I really enjoyed it!